﻿ Where In The World Did I Leave My Car Keys? Home/Blog/﻿ Where In The World Did I Leave My Car Keys? Can’t find anything? Become mindful. It seems most of my friends are always looking for their keys. 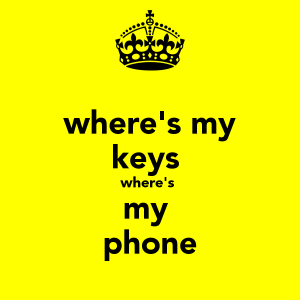 In my case, it’s my cell phone. Before cell phones, we always knew where our phone was—just where we left it. 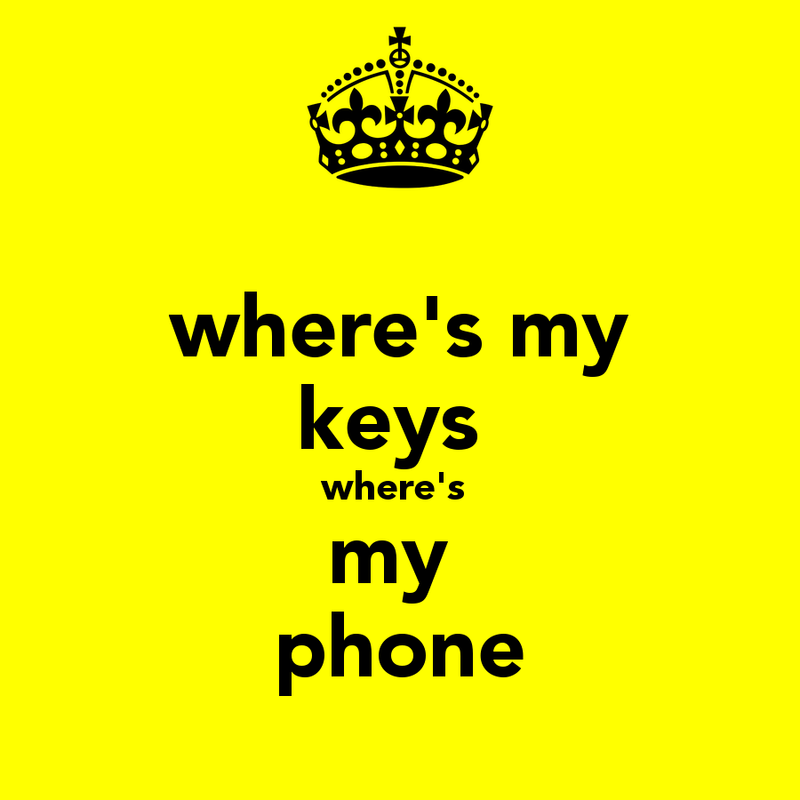 Why can’t we find our keys, our car in the parking lot or our cell phone? I hear people saying it’s because I’m getting old, I can’t remember anything. Frankly, I doubt that’s the problem. The idea is to make important things a priority. Put significant things in the same place every day; think about the phone that was attached to the wall. You never wondered where it was, did you? Did your mom put ‘idiot’ strings on your mittens? She was smart; she knew the mittens would be missing. I can’t tell you how many ‘one handed’ gloves I own. I don’t even buy nice gloves anymore. Do you have trouble finding your car at the mall? Take a photo of where you parked it so it won’t be a problem. The other day my 90-year-old cousin went with us to the mall. He said while we were shopping he was going to take a walk. I was afraid he wouldn’t be able to find the car, so I asked what his strategy was. He replied finding the car wouldn’t be a problem because it was the only thing on his mind. Good point; if you make something a priority, it won’t be a problem. Have you ever noticed if you tell your five-year-old he will be visiting grandma next week how every morning he’ll ask if it’s time to visit grandma? My next-door neighbor is moving to Colorado and leaving her four-year-old with grandma for a month. The little girl can’t wait to visit grandma, and every morning asks whether today’s the day. I was afraid when I got my wireless mouse it would be another thing I couldn’t find. I can’t imagine not being able to find my mouse; so far, it’s where it belongs. I’ve scared myself straight! Here are some simple ideas for keeping your life straight. If it’s important, make it a priority. Think about arriving home from the supermarket with lots of bags. You had to go around the block three times to find a parking space, and you’re all upset by the time you open the door. You throw your car keys somewhere along with your phone. By the time you get done putting the groceries away you can’t find either. The more you think about it the more upset you get. You start blaming old age, your spouse or the cat. If you make them important, you’ll never lose them. I have a key rack outside the kitchen, when I walk in the house; the keys go on the rack. I still can’t find the usual place for my phone. I think we’re so used to answering our phone immediately that we keep it near us, or somewhere we can reach it. How about putting it with your tethered phone or by your computer? With everything in your life, watch when you are losing your focus and jot things down. Don’t distract yourself. Do you find in the middle of things you decide to get up and do something else or stop and make a phone call? If the thought that comes into your mind is important to write it down. Don’t feel you have to act on it. I know we think that being able to multitask is a sign of strength. Practice paying attention to one thing at a time—you’ll get more done. Work at it and see where it takes you. Lisbeth Calandrino is a business coach who helps people achieve their dreams and their goals. For more information on hiring Lisbeth, check out her web site, www.lisbethcalandrino.com. A few weeks ago I took my dog for a walk at night in a large grassy athletic field. When I got home I realized that I had dropped my phone someplace in a field with a football and 2 baseball diamonds. It was pitch black, but quite. I took another phone with me and began to call my phone. Thank god for bright screen lights and loud, obnoxious ring tones! Are you lucky; I can imagine it all. Thanks. It’s not always easy but people are just people and they’re re all trying to get the sames things out of life. You and I are innocent bystanders. Thanks for your comment.